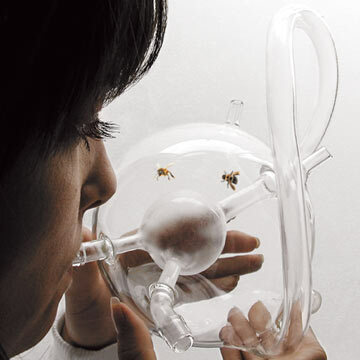 BEES BECOME DIAGNOSTICIANS in a glass instrument designed by artist Susana Soares. The insects, which have exquisitely sensitive antennae, can be trained to show a Pavlovian response to odorous molecules that indicate a single physiological factor, such as ovulation, or a disease state, such as tuberculosis (as in the instrument shown). When a user blows into the object, the bees either are attracted to the chamber holding the breath (signaling a positive result) or ignore it completely (negative). Future targets could include lung cancer and diabetes. Coral reefs house millions of species, and each holds the possibility of millions of cures.